Major Spring floods hit U.S. and Canada. Tornadoes rake across Alabama killing 243. 2755 daily high temperature records set in U.S.
Tornadoes, heat waves, hurricanes, floods, massive snow storms, and drought. What in the world is going on? In 2011 we have seen record numbers of deaths from tornadoes, unusual heat waves, severe drought, and flooding across the United States. Are these extreme weather events due to human-induced changes in climate or are we dealing with natural variations caused by natural phenomena such as La Nina and El Nino? Scientists suggest that while the types of extreme weather events that we are seeing have been rare in the past, a slight shift in average global temperature is likely to increase the number of extreme events from an event that happens once in a century to one that occurs several times a century. Articles from Scientific American and Newsweek express the opinion that the extreme weather we are observing is direct evidence that climate change has occurred. Are these interpretations correct? Michael Crichton's State of Fear(2004), an eco-terrorism techno-thriller, uses global change as a story backdrop. The message conveyed in the book is that changes in the Earth system are due to natural climate variability and an incomplete understanding of climate science. Although the book is fiction, it does express opinions held by significant percentages of the population in the United States: 31% who believe global warming is not occurring, 49% who do not see any dangerous impact due to changes driven by global warming, and 53% who believe there is no scientific consensus about global warming. Some of these views are in part due to the way scientific findings are reported. Scientific reports on frequency and intensity of hurricanes, for example indicate that there is insufficient evidence to attribute extreme hurricane events to human induced climate change. The decision to allocate resources to mitigate extreme weather events is difficult to justify without unambiguous evidence and citizens who are convinced that there is a need. Communities, states, regions, and nations have had to contend with the 2010-2011 wild weather and need to make plans to mitigate the consequences of future similar events. However, any planning must be based on genuine changes in the earth system and not on random variations. If weather extremes become the new weather means, what weather events must a community plan for in the next 10 to 100 years? Finding answers to this question is critical, complex, risky, and likely fraught with ambiguity. Jay Gulledge, Pew Center senior scientist, clearly summarized the issue: "We've got to develop a risk-based mindset – make educated guesses as to where … events are most likely to happen, and then prepare…. This informs the kind of investment we need to make…. [But] we have a political problem. If you prepare for [an extreme event] and it doesn't happen, you have to pay politically." The IPCC is interested in whether climate change has an impact on weather, especially as it relates to extreme events such as major precipitation events, intense storms, heat waves, drought and hurricanes. Now that you are working as interns to their committee on climate change, they have asked you to conduct an analysis of weather and climate events using NASA's NEO tool. They will be particularly interested in whether your analysis suggests a link between extreme weather events and climate change. An example of using NASA NEO to study climate is located here. NASA GISS has been contacted by the National Governors Association to provide an analysis for your state or region about extreme weather events with the greatest probability of increasing. Coupled with this report is a detailed ESS analysis of how these events will impact the state or region to aid the governors in developing mitigation policies. NASA is expecting a trend analysis of environmental measures, such as those accessible through Giovanni, MY NASA DATA, or NASA's Global Climate Change: Vital Signs of the Planet, as the basis for your analysis. "Changes in climate not only affect average temperatures, but also extreme temperatures, increasing the likelihood of weather-related natural disasters..." More information. 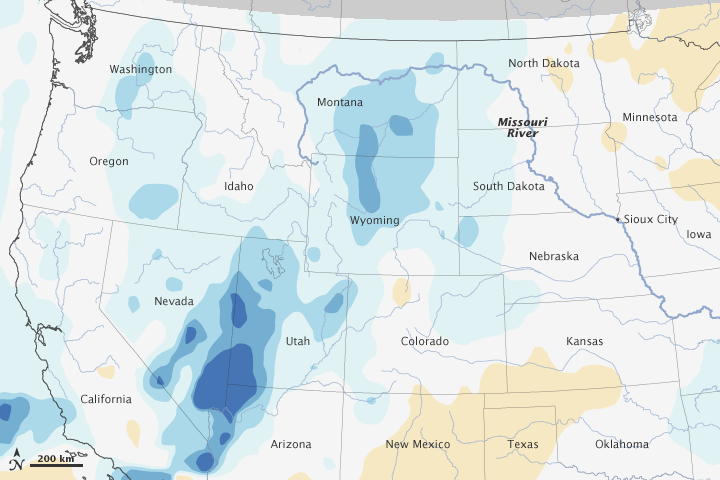 Rainfall anomalies Missouri River Basin for May 2011, compared to the 1998–2010 average. Below-average percentages are brown, and above-average percentages are blue. Rivers are thin blue lines. Full discussion. 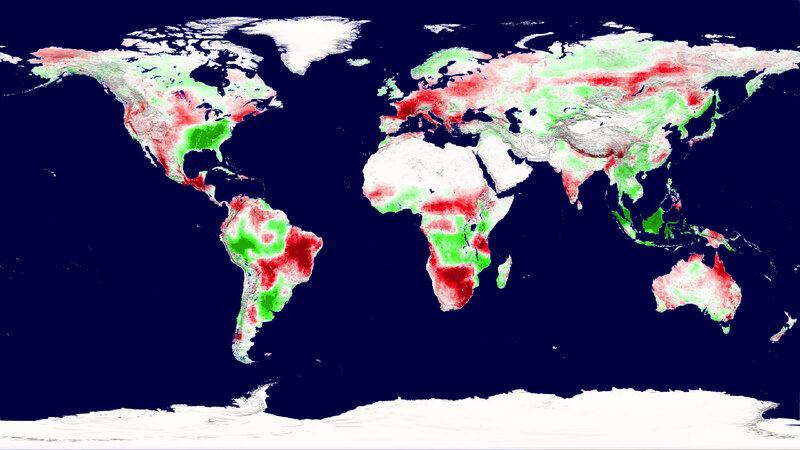 A snapshot of Earth's plant productivity in 2003 shows regions of increased productivity (green) and decreased productivity (red). Tracking productivity between 2000 and 2009, researchers found a global net decrease due to regional drought. Additional information.. The day after a massive snowstorm covered nearly two-thirds of the nation, the skies cleared over the Midwestern United States, revealing the impact of the storm. On February 2, 2011, snow covered the ground in a solid swath from eastern Arizona to the fringe of the storm in Indiana and Michigan. Eastern states were still swathed in clouds. More information..
Land surface temperature anomalies for July 20 to 27, 2011, the height of the heat wave in much of the southern, midwestern, and eastern regions. 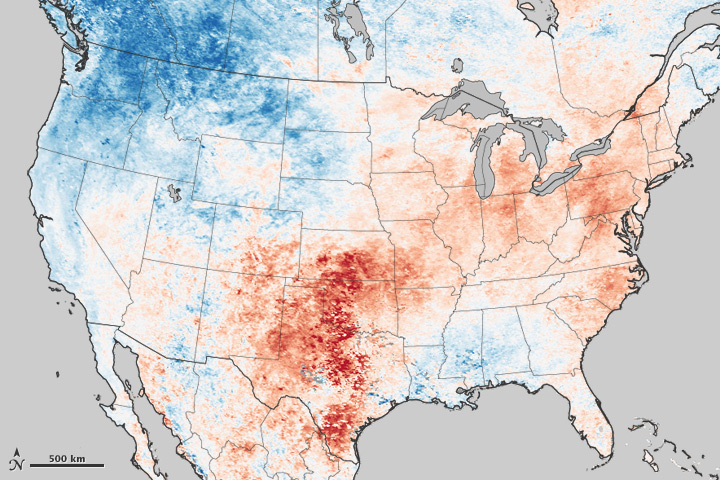 Reds indicate temperatures that were warmer than average, and blues below average. More information..
Data from the Atmospheric Infrared Sounder (AIRS) instrument onboard NASA's Aqua satellite revealed a notably anomalous weather pattern preceding and during the first days of the Russian forest fires. See also: NOAA report:Natural Variability Main Culprit of Deadly Russian Heat Wave That Killed Thousands. Mountain regions are very susceptible to regional climate variability. With above-average rainfall in Colombia, coffee beans are becoming more expensive. Provides a clear distinction between weather and climate. A good first read to distinguish between extreme weather events and changing trends related to climate. Basic "what, why and how's" of climate prediction. State and local governments are researching and making plans for a future with more severe weather. A specific example is the work being done by Washington's Department of Ecology which lays out types, conjectured causes, and effects of extreme weather. A review of research related to extreme weather and climate change. The article provides an overview of arguments related to the connection/no connection to climate change and extreme weather, indicators that should be monitored, and public views. Excellent primer! This interactive site has videos, maps, quizzes, severe-weather preparation guides, and other information for students provided by the US' Environmental Protection Agency. Summary report of 24 climate indicators, each describing trends related to the causes and effects of climate change. Focuses primarily on the United States, but in some cases global trends are presented to provide context or a basis for comparison. Section of particular relevance: Weather and Climate - explores temperature, heat waves, precipitation, drought and tropical cyclone intensity. A summary of projected changes in climate and extreme events such as heat waves, cold waves, storms, floods and droughts between now and 2100. Explores key issues and projected impacts of global climate change by U.S. region or by sector. Documents the current and future consequences of global climate change. Has links to causes, evidence, and uncertainties about global climate change. This award winning site, NASA Global Climate Change: Vital Signs of the the Planet, has a wealth of resources and activities related to climate, and is also a gateway to NASA data through NASA's Eyes on Earth. Of particular relevance to this module are unresolved questions about climate. Excellent review of current research, projections, and graphics to visualize weather and climate data. This three-part series of articles examines whether there is a connection between observed extreme weather events and climate change. An excellent examination of the evidence and impacts. Storm World, by Chris Mooney, provides an excellent case study of science, politics, and the nature of science related to global warming. The link is a review of the book. Interactive lesson suitable for younger children. Teaches easily-understood causes and effects of global climate change with intermittent quizzes. Students compare historic weather information to current data to determine if there has been a significant temperature change. Additional questions and analysis can be added to the module for advanced learners. Useful information items and activities to develop understanding of climate and climate change. Tackle the question - How do we know if the climate is changing?, play the Wild Weather Adventure game or explore past and future changes with the Climate Time Machine. When studying hurricanes it is important to understand that, for a hurricane to grow, warm water is an absolute necessity. So if the Earth continues to warm, what does that mean for hurricanes and their intensity? In this unit, students will look at past data of hurricanes with the MY NASA DATA Live Access Server to discover any correlation between global climate change and hurricanes. This multi-day investigation requires students to create diagrams - climatograms - to display monthly average weather conditions such as temperature and precipitation at a particular location. The data is used to design an investigation about the factors that influence climate. This is an open-ended unit suitable for older students. The ESS Module, Earth System Science Data and Analysis, provides basic instruction on data analysis. Another resource that you may find useful is Climate Change Visualization for accessing Giovanni, MY NASA DATA, and Eyes on Earth data to visualization climate information. The GLOBE Student Climate Research Campaign (SCRC) provides students opportunities to measure, investigate, and understand the climate system in their local communities and around the world. Using GLOBE protocols and data, as well as other datasets, students take climate-related measurements and investigate research questions about climate. The SCRC provides an opportunity for you and your students to directly measure and document what is happening in your community and practice the skills of scientific argumentation. An interactive tool for examining changes in climate extremes across the US and by region including: anomalous temperatures, precipitation, droughts, and tropical storms. "What is Citizen Science? Research often involves teams of scientists collaborating across continents. Now, using the power of the Internet, non-specialists are participating, too. Citizen Science falls into many categories. A pioneering project was SETI@Home, which has harnessed the idle computing time of millions of participants in the search for extraterrestrial life. Citizen scientists also act as volunteer classifiers of heavenly objects, such as in Galaxy Zoo. They make observations of the natural world, as in The Great Sunflower Project. And they even solve puzzles to design proteins, such as FoldIt." A clearing house of Citizen Science projects, several of which involve collecting data to document the possible impact of climate change on ecosystems. These require very little equipment but provide you and your students the chance to be part of major scientific investigations. There is something for all ages!